Reduce the risk of you modifying the wrong system. Did you have too many windows open? Save your time by not investigating data in the wrong system. Were you in Development, Test or Production? Ensure you have logged into the correct system. Sandpit, Production or Copy of Production? Goal: Set the bottom right-hand corner of the GUI to always show the System-ID. 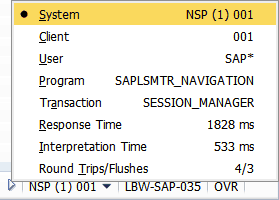 Click the left facing arrow in the SAP GUI status bar (in the bottom right corner). Click the small black downward facing arrow to choose which property you would like to see. In this case we want the top one, the ‘System’. Now the SAP GUI status bar is your friend and helping protect the production system from you. Have you implemented the other ‘Efficiency Tips for Using the SAP GUI’?